Thank you for visiting our website. You can become a member of our CAHL by registering your own team online below in just two easy steps for our upcoming CAHL 2018-2019 Season. Our Weeknight Divisions will begin on Monday, September 24, 2018, while our Weekend Divisions will begin on Friday, September 28, 2018. New teams are welcome to become members by registering online below as well, all you need are a few small groups of friends (teams have about 15 skaters and a goalie). We also have Unrestricted Free Agents to help you complete your team if you don't have enough players. New custom matching colour team jerseys can be provided for you as well at a CAHL team rate. Please email us at info@cahl.ca for more information or register online below in just two easy steps to become a member today. -29-33 or more game season (28 regular season games and a guaranteed minimum of 1 playoff game and up to a total of 5 or more playoff games). -All games are 1.25 hour ice times. -100% weeknight games only on Monday, Tuesday, Wednesday, or Thursday night. -About one game per week. -Never have any games on any Friday, Saturday, or Sunday. -Keep 100% of your weekends free for yourself, your family, and your friends. -2 referees and a timekeeper per game. 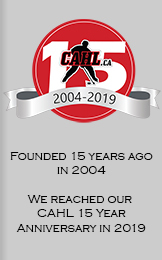 -Our referees are Hockey Canada Certified every year with many years of experience up to former Major Junior WHL - Western Hockey League. -Our timekeepers have many years of experience. -Multiple divisions and possibly 1 or more realignments during the season for parity. -Includes player insurance through CARHA. -100% of regular season games will be at north arenas* such as Edge School, Crowchild Twin Arena, etc. (playoff games may vary between north and south arenas). -100% of regular season games will be at south arenas* such as Flames Community Arenas, Ernie Starr, Southland Leisure Centre, etc. (playoff games may vary between south and north arenas). We have added another regular arena/time at ECTA (Wed 10:30PM). Due to the unfortunate roof collapse at our main south arena, the Fairview Arena, we will not be having any games at the Fairview Arena. The south arenas/times will be: Flames (Tue 11:00PM Red and Gold, Wed 11:00PM Red), City of Calgary arenas (Mon 10:45PM Southland for Jan-Mar, Thu 10:15PM Ernie Starr and Southland for Oct-Dec), and possibly some other random south arena/times. *The Weeknight North Divisions are guaranteed north arenas for the regular season and the Weeknight South Divisions are guaranteed south arenas for the regular season. However, there is no guarantee of any specific arenas or of the number of games at any specific arenas and arenas may vary among teams/divisions. **Skill levels are very difficult to describe without knowing the playing background of every player on every team and are only a very rough approximation and will vary greatly. -100% weekend games mostly on Friday or Saturday (there may be some Sunday games at early times of no later* than 9:45PM). -About one game per weekend. -Never have any games on any Monday, Tuesday, Wednesday, or Thursday. -Keep 100% of your weeknights free for yourself, your family, and your friends. -Go out with your team after every Friday or Saturday game. -No need to think about waking up early the next morning for work after your Friday or Saturday game (if working Monday to Friday). -We play at arenas** such as Edge School, Don Hartman North East Sportsplex, Flames Community Arenas, etc. *It is possible that the start of any regular season or playoff game may be delayed by problems such as, however not limited to, an ice resurfacer (Zamboni) malfunction, a player injury, a playoff game that needs extra time, etc. **There is no guarantee of any specific arenas or of the number of games at any specific arenas and arenas may vary among teams/divisions. ***Skill levels are very difficult to describe without knowing the playing background of every player on every team and are only a very rough approximation and will vary greatly. 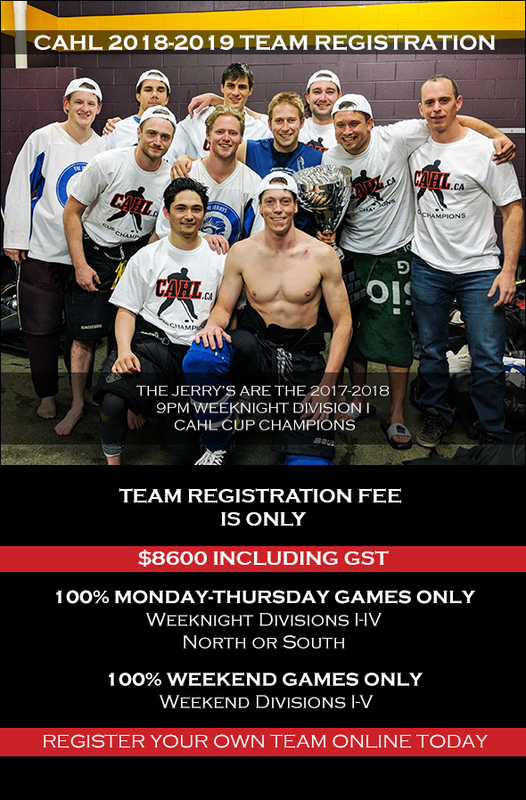 The CAHL 2018-2019 Team Registration Fee for Weeknight Divisions I-IV North or South, and Weekend Divisions I-V is $8600 including GST, which works out to about only $538 per player for an average 16 player team (15 skaters and a goalie). Teams can still register to join after Friday, September 14, 2018. Teams can still register to join until Thursday, September 20, 2018. The Total Team Registration Fee (balance) Deadline is on Friday, September 14, 2018. Our Weeknight Divisions will begin on Monday, September 24, 2018, while our Weekend Divisions will begin on Friday, September 28, 2018. The Weeknight Divisions' Team Schedules will be posted after the Team Registration Fee Deadline (Friday, September 14, 2018) on Friday, September 21, 2018 when the final number of teams have been confirmed. The Weekend Divisions' Team Schedules will be posted after the Team Registration Fee Deadline (Friday, September 14, 2018) on Sunday, September 23, 2018. You may use your credit card to make a Team Registration (Non-Refundable) Deposit Fee payment of $2000, a Team Registration (Non-Refundable) Balance Fee payment, a Team Registration (Non-Refundable) Total Fee payment in the first form below, or a Team Registration (Non-Refundable) Partial Fee payment in the second form below. Please enter your Team Name, and your 1st and 2nd Division Choices in your payment memo. All teams need to have two sets of matching colour team jerseys (a dark home set and a light away set) with numbers on the back. There is a grace period of the first five games of the regular season when this won't be enforced yet. After the first five games all teams will need to have two sets of matching colour team jerseys. In the event that a player forgets his/her matching colour team jersey he/she will have to wear a jersey that is as close as possible in colour to the matching colour team jerseys and he/she will have to ask the referees for permission to use the non-matching jersey. The referees, at their sole discretion, may or may not give permission if they deem that the jersey is too close in colour to the opposing team. If the referees do not give permission then that player won't be permitted to play unless he/she can get a jersey that is closer to matching the team jerseys. If you need new custom matching colour team jerseys please email us at info@cahl.ca for a CAHL team rate. Please note that by matching colour jerseys we mean matching base colours for the jerseys. The jersey accent colours can vary among the players on the team. For example if a team has all white base colour jerseys, but some jerseys have red stripes while some jerseys have black stripes or no stripes at all, then that is still fine since all of the jerseys still have the same matching base colour of white. The point of this rule is to help prevent confusion and conflicts for all teams, skaters, goalies, and officials. The point of this rule isn't to have all teams look exactly like NHL teams. For example if a team only has 1 set of matching base colour red jerseys and plays against a team with only 1 set of mismatching many base colour jerseys which includes colours similar to red then it is confusing to the skaters and goalies on both teams and for the officials. That is why it is important and every team needs to have 2 sets of matching base colour jerseys with numbers on the back. For economical reasons teams can always have 2 sets of matching base colour jerseys of different quality. For example teams can have 1 high quality set of matching base colour dark jerseys with numbers on the back plus 1 set of matching plain solid light colour practice jerseys with numbers on the back. Or the most economical way would be to have 2 sets of matching plain solid colour practice jerseys. For example teams can have 1 set of matching plain solid dark colour practice jerseys with numbers on the back and 1 set of matching plain solid light colour practice jerseys with numbers on the back.